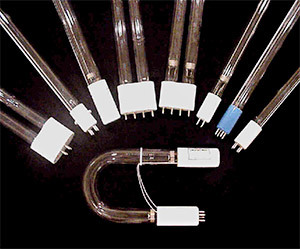 Lamps manufactured by First Light are made of pure quartz tubing versus soft glass to maximize the lamps usable life. Soft glass lamps have reduced output and shorter usable life due to the negative effects of solarization. First Light Technologies’ products are used in the disinfection of municipal wastewater, industrial process water and primary drinking water. First Light’s lamps are also used extensively in the disinfection of air and HVAC systems. Additional applications include food and beverage processing and ink curing applications. First Light’s full line of germicidal lamps is designed to provide the highest level of performance for each of our partner’s applications. Note: * UV output is measured at 253.7nm at 100 hours under laboratory conditions. Output may vary under actual operating conditions. * Base face measurement is from base to base, not including pins. ** Lamps are also available in both Pure Quartz (VH) or Synthetic Quartz (VHS).